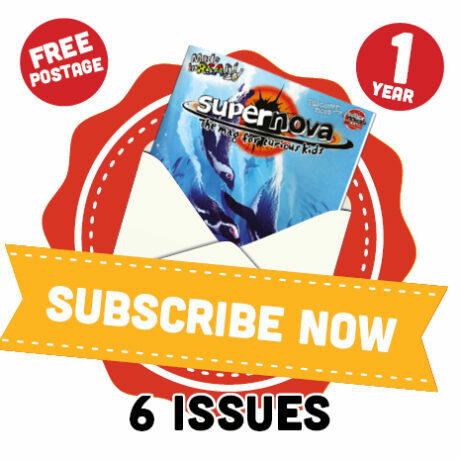 Subscribe to Supernova for 6 or 12 issues and we will mail each new issue to you as we publish them. Postage is included in the price. Supernova is a general interest magazine of the highest educational standard for children between the ages of 8 and 14. Through this print magazine we aim to make children aware of issues which affect them, their community and their environment, and give them the tools and inspiration to become active and responsible world citizens. The content of the magazine is fun and informative, focussing on topics such as ecology, natural sciences, technology, history and world cultures, as well as arts, sports and social issues. The magazine also loosely follows and enhances the school curriculum, and is used extensively by teachers and homeschooling parents as a teaching resource. Don’t miss an issue! Subscribe to Supernova for 6 or 12 issues and we will mail each new issue to you as we publish them. Postage is included in the price.